MOSCOW, Russia -- Thousands of opposition demonstrators marched in front of the parliament building in Kiev, Ukraine, Saturday, protesting a deal reached earlier this week to extend Russia's military presence in the former Soviet Republic, national news media reported. Opposition protesters wave hands at a mass meeting in front of the Ukrainian Parliament in Kiev on Saturday. Parliamentary opposition leader Yulia Tymoshenko -- the former prime minister who lost to Viktor Yanukovych in the presidential election run-off in February -- told protesters Saturday that the ratification of the treaty must be prevented at all costs. She claimed that Yanukovych is "selling out" Ukraine, has "openly embarked on the path of destruction of [Ukraine's] national interests, and has actually begun the process of eliminating the state's sovereignty," according to a transcript of the speech on her website. After the deal was signed Wednesday by Yanukovych and Russian President Dmitry Medvedev, Tymoshenko said it violated part of the Ukrainian Constitution, which forbids the country from hosting foreign military bases after 2017. Saturday, protesters reportedly adopted a resolution calling the agreement an "unprecedented act of national treason and disgrace," and calling on all opposition groups to unite against it. 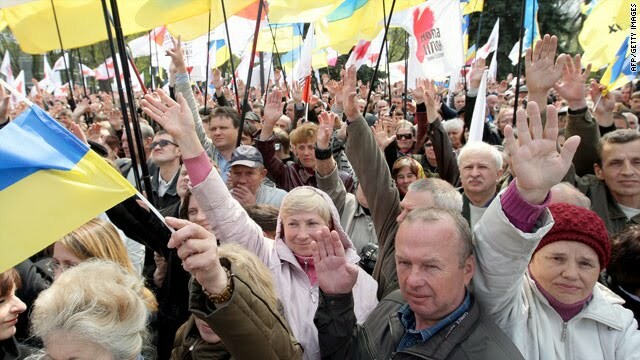 According to Tymoshenko's website, some 10,000 people gathered at the rally. But Ukrainian national news agency UNIAN estimated the number of protesters at 5,000. The deal extends Russia's lease of a major naval base in the Black Sea port of Sevastopol, Ukraine, for an additional 25 years, in exchange for a 30 percent cut in the price of natural gas that Russia sells to Ukraine. The agreement may bring an end to years of disputes over natural gas prices, which culminated in Russia turning off the pipeline to Ukraine. The dispute affected not only Ukrainians, but many Europeans who depend on Russian gas pumped through Ukraine. The two countries had been at odds ever since the "Orange Revolution" swept Yanukovych's fiercely anti-Russian predecessor Viktor Yushchenko to power in 2005. Throughout his time in office, Yushchenko repeatedly threatened to expel Russia's Black Sea Fleet from Sevastopol. The Russian military lease there was scheduled to expire in 2017. "The prolongation of the Black Sea Fleet's presence in Sevastopol is essential to Russia," Yanukovych said Wednesday. "We understand that the Black Sea Fleet will be one of the guarantors of security on the Black Sea." The Kremlin-friendly Yanukovych, who hails from predominantly Russian-speaking eastern Ukraine, trounced Yushchenko in national elections last January. The Russian president said the new deal added a "concrete and pragmatic dimension" to centuries of relations between Ukrainians and Russians. Opposition groups in Ukraine, however, were quick to denounce the agreement. Yuschenko's "Our Ukraine" party said the treaty would lead to the "Russification" of Ukraine. Opposition activists decided Saturday to stage another protest in front of parliament April 27, when the deal will be put to a ratification vote.